Thank you CTSandThat! for sponsoring this post. All thoughts and opinions are my own. Okay, so I have this space in my kitchen that I loathe. Every time I walk by it I feel annoyance, and every time we have a guest over I am embarrassed. 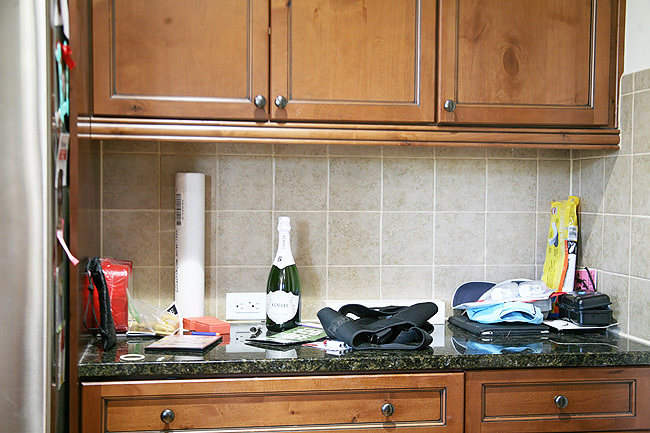 Our entire house can be clean and tidy, but this one space in our kitchen seems to be a catch-all for any and everything. Mr. Cute loves to throw his "stuff" here at the end of each day. The kids love to hide stuff here. Mail gets placed here various times a week. If someone doesn't know where to put something, they stick it here. We're all contributors, but it drives me nuts. I've finally hit the point where I can't take it anymore, and want the junk counter gone. Because that's what it is. Some people have a junk drawer, but somehow we have managed to create an entire five foot section of space dedicated to all the things we don't have a place for anywhere else. So this week I took a stand, and decided we are getting rid of the junk counter! The space itself isn't my favorite. We have a large kitchen, but other than the cabinets, I feel like we missed the mark on making it a more useful space when we built the house. Having a mail center was popular at the time, but when the builder finished our kitchen and we walked through we noticed that they made several mistakes - one being actually putting what makes a "mail center" into the mail center space. The tile is all wrong, and ultimately it's needs an overhaul. 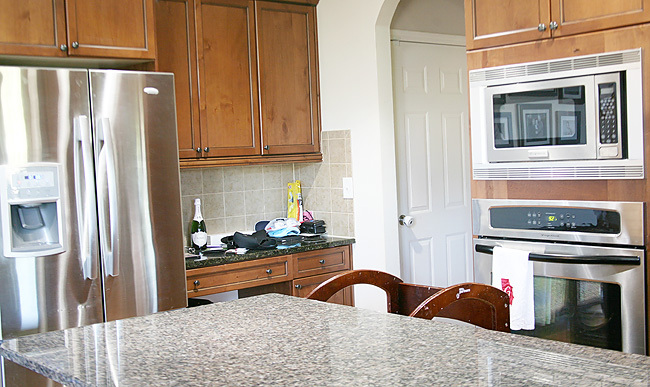 We have been on the fence about an entire kitchen renovation for years, and at the beginning of this year we had everything picked out, designs done, and a contractor all lined up. And then we decided maybe we wanted to move. So we are at a crossroads on that project because other decisions have to be made. Either way, I decided it was time to rid ourselves of the junk counter. I brainstormed what would be best for the space daily. The thought came to make it an organized center of some sort with calendars and a mail basket. But what's the fun in that? 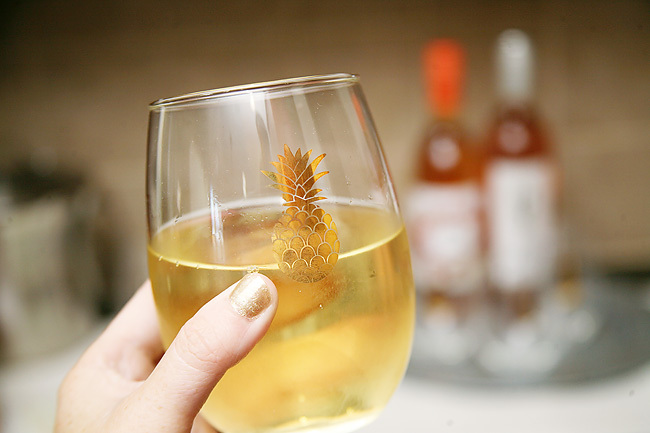 Wine bar! A wine bar or cocktail space came to me. We like to entertain and this would be the perfect spot to create a cocktail center for our guests. 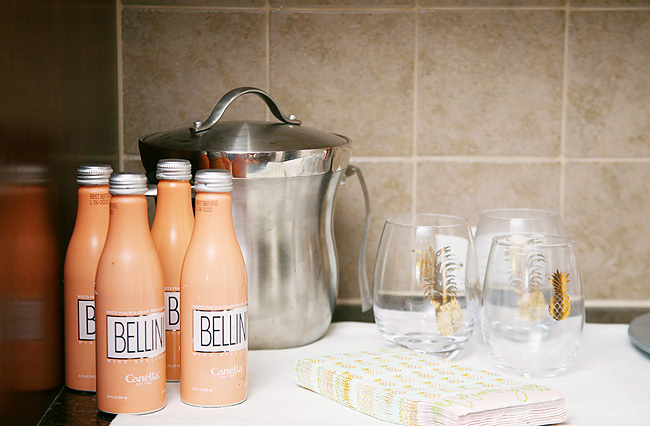 We have a full bar in the basement, but we notice guests tend to congregate in the kitchen. My goal for this project was to do it for under $100. I wanted to keep the budget small because there's that whole renovation/moving thing hanging over our head. I Need That, That... andThat! 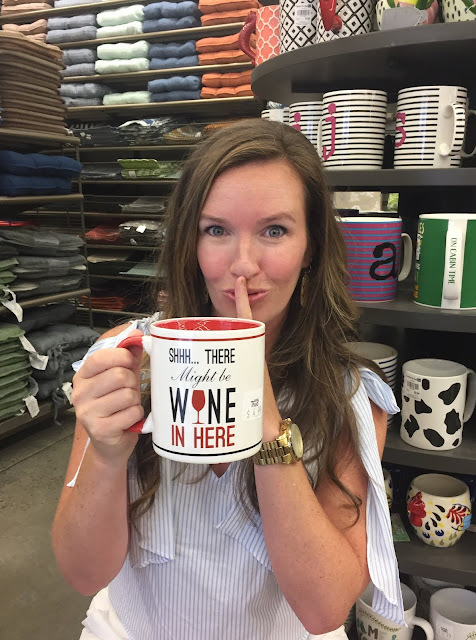 Over the weekend I grabbed one of my favorite shopping buddies and headed to one of my favorite stores - andThat! If you guys don't have an andThat! near you you are totally missing out! 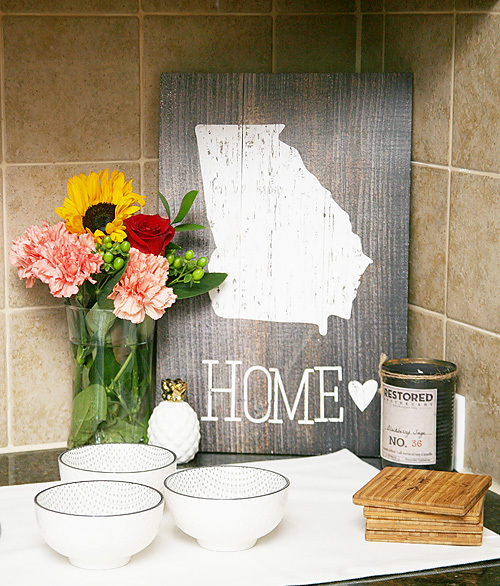 It's a home decor, furniture, entertaining, seasonal decor, and grocery store all rolled into one. In the BEST way possible. Everything is made of amazing quality, and priced so well! I just knew it would be the perfect spot for this project. I went in with an open mind in terms of what I was looking for. I just knew andThat! would have a ton of options at a great price, and tons of items that fit current trends. I was more worried about staying on budget once I passed through those sliding glass doors. I had a rough list in my head of necessities for the wine bar, but other than that it was a blank canvas. Right when I walked in I spotted about a million things that I loved! What grabbed my attention first was their Locals section. andThat! does a great job of showcasing fun local finds - both by local artists and vendors, as well as things that represent the community that the store is in. 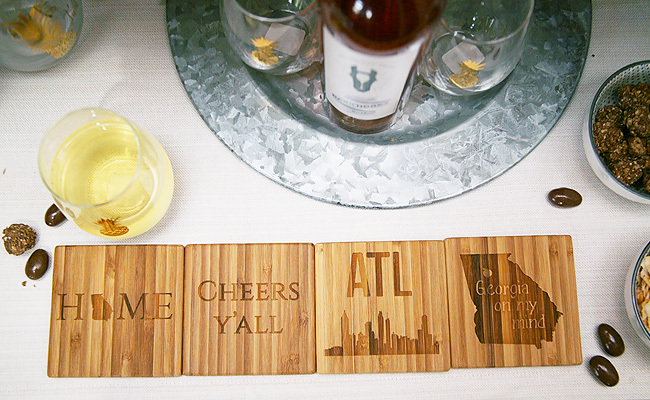 We are all about some home state/home town love, so I was instantly smitten with idea of decorating the wine bar with some peach state love. I spotted this Georgia themed sign and knew it would be a great anchor for the space. And then these candles grabbed my attention. Not only because they smelled like a little slice of southern heaven, but because they had several options - including the city we live in. I couldn't resist this one though (for obvious reasons). Next up I made my way towards their glass wares and entertaining section. I found so many items I wanted to bring home with me! 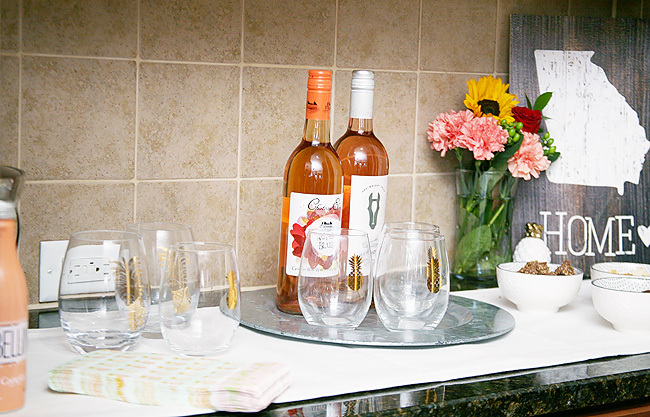 They have a wide selection of stemless wine glasses, which would be perfect for the bar area. I had a hard time choosing because there are so many fun options that fit the hometown theme perfectly! After going back and forth I finally decided on gold pineapple ones. I could see where they would be timeless, and they were only $2 which helped with the over all budget. 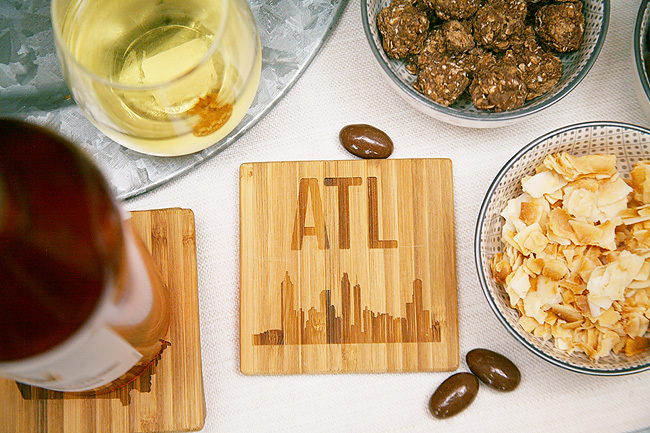 In this area, I perused their wide selection of serving pieces and wanted to scoop up everything and put it in my cart. 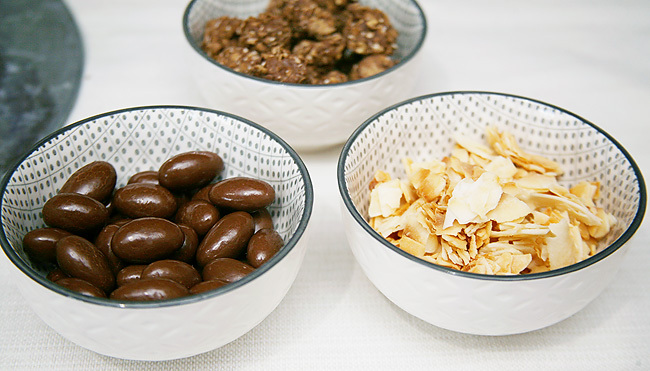 I spotted these bowls and thought they would be great to set out on the bar filled with snacks or candy (because hello yummy chocolate with my wine!) for our guests. I wanted one of the fun colors they had but in keeping with my theme, and the color scheme of the space already, I chose adorable grey ones. I turned the corner and found myself right in the middle of the most perfect section of all - the wine section! andThat has a HUGE selection of wine on hand. I am so impressed! Not only do they have some of the best wines, they also support a lot of local wineries. I have never noticed that in previous visits, but their selection of locally crafted wines is quite impressive. They also have a huge selection of Rose! 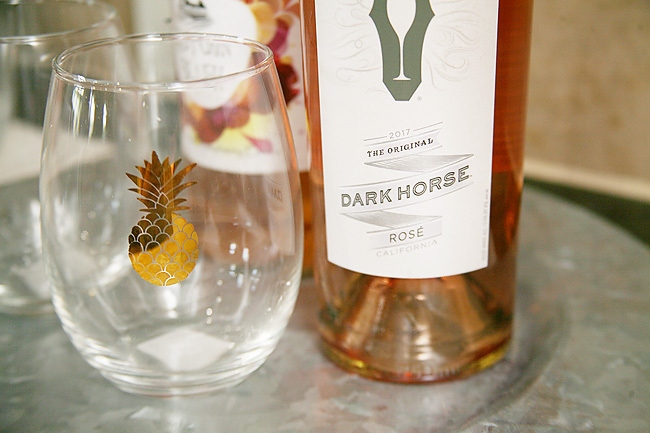 One of my favorites, and in the summer nothing tastes better than a nice cool glass of Rose. I couldn't resist snagging a few bottles. In addition to a large wine selection, andThat also has a large food section. Complete with locally inspired and made items. So much yum in one spot! My southern tastebuds were watering. I needed to get out of there before I completely blew my $100 budget! Before I made it to the cash register though I spotted some amazing last minute goodies. The minute I saw these coasters I knew I had to grab a few! They fit in with the theme and I was able to customize my own little set. I loved that! I also logged the idea for later that it would make for a great gift idea when the holidays rolled around. Once I settled on the ones I wanted I made my way to check out. But not yet! I was just about there and then I realized they had little mini bottles of wine. I couldn't resist! 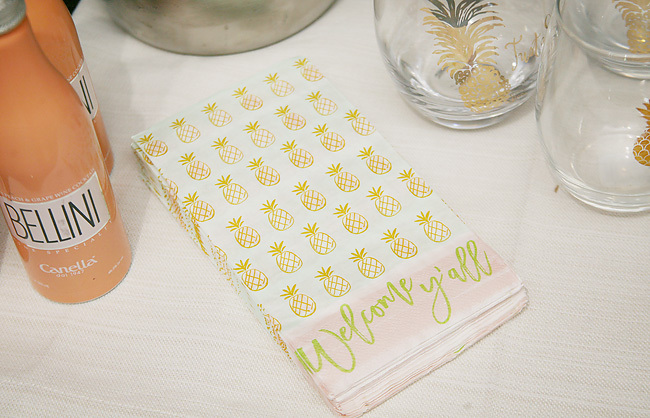 I still had room in my budget so I thought I would grab a few to have out as favors for my next little soiree. It would be a fun little treat to surprise everyone with. I put blinders on for the last ten feet of the store because - trust me - there was still so much more that I could have grabbed! I checked out and even with wine I came in at $98.43! 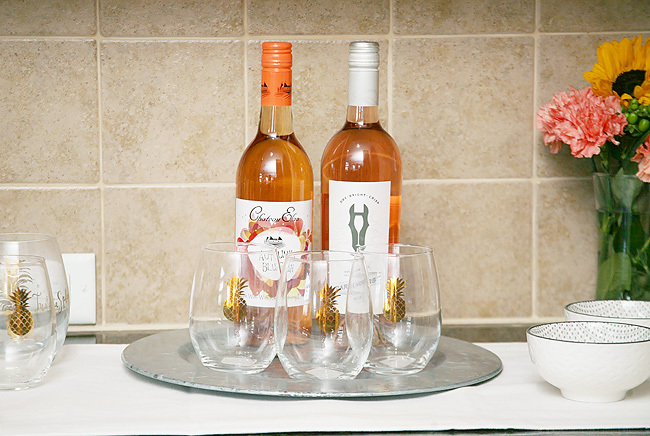 After shopping, creating the wine bar itself was so easy! The hardest part was cleaning out the space and figuring out the best way to arrange all my new goodies. I had a few things on hand to put mix in with what I purchased. I love shopping my home and reusing things I already own. It's always amazing to see how items can transform in a new space. I actually purchased these silver tin chargers on a previous trip to andThat, and thought I could work it in as a small tray for this purpose. Everything else came together perfectly. I couldn't wait to have my girls over to celebrate my new clean space! All those local treats and delicious wine didn't stand a chance! I love that we now have a cleaner space and a designated area for guests to grab a refreshment. It's in a great location that people can grab a little something before heading out to the screened porch or for dinner in our dining room. 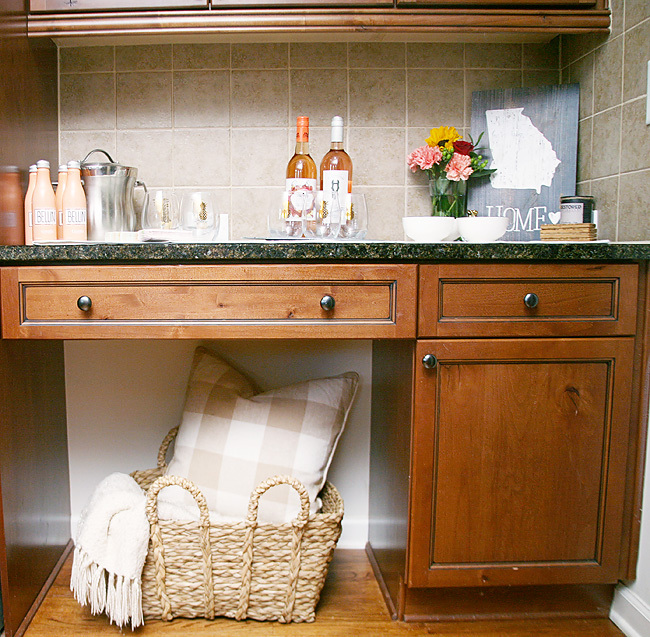 I can easily pull out bar tools as necessary from the drawers or grab an extra wine glass or two from the cabinets. 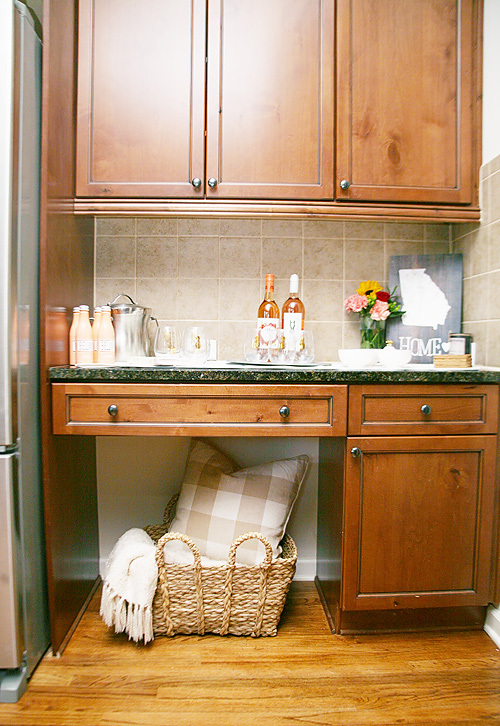 A wine bar was the perfect idea for this space! And it makes me smile to see all these fun little nods to our favorite state. 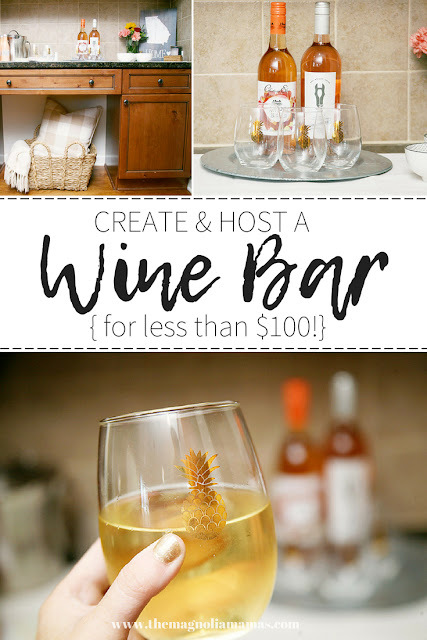 I'm still amazed that I was able to create a wine bar and purchase all food and drink in one spot for under $100! Now here's hoping that this is a permanent change and people keep their junk out of my wine space. Because I can assure you - mommy + wine + junk will not be a good combo. To learn more about andThat! visit the andThat! website or check out the hashtag #andThatFunFinds on social media.